It’s pretty easy to trace the lineage to its historical source: Saison Dupont. One of only a couple of breweries still making saisons by the 1970s, it is as close to synonymous with the style as Urquell is to pilsner. But history and influence are not identical. Very few breweries make a pilsner like Urquell’s, nor a saison like Dupont’s. (I think part of this is because trying to replicate Dupont feels vaguely sacrilegious; a bigger reason is that it’s so damn hard to do it. Dupont uses a finicky strain of yeast that likes blood-warm fermentation temperatures, and most breweries don’t mess with it.) Dupont makes a beer with a stiff mineral profile, strange esters, herbal hops, explosive effervescence and a desert-dry finish. As Americans have taken up saisons, it’s not the direction they’ve headed. Instead, they make beers with less assertive, more familiar esters in the citrus family that are light in hopping and only medium-dry—something like a kellerbier crossed with a Belgian pale ale. If you start tracing these beers back to their source, you find yourself not in Belgium, but just across the border, in Esquelbecq, France. This is where Daniel Thiriez started his farmhouse brewery (also named Thiriez) 19 years ago and where he started brewing beers that look a lot more like American saisons than does Dupont’s. 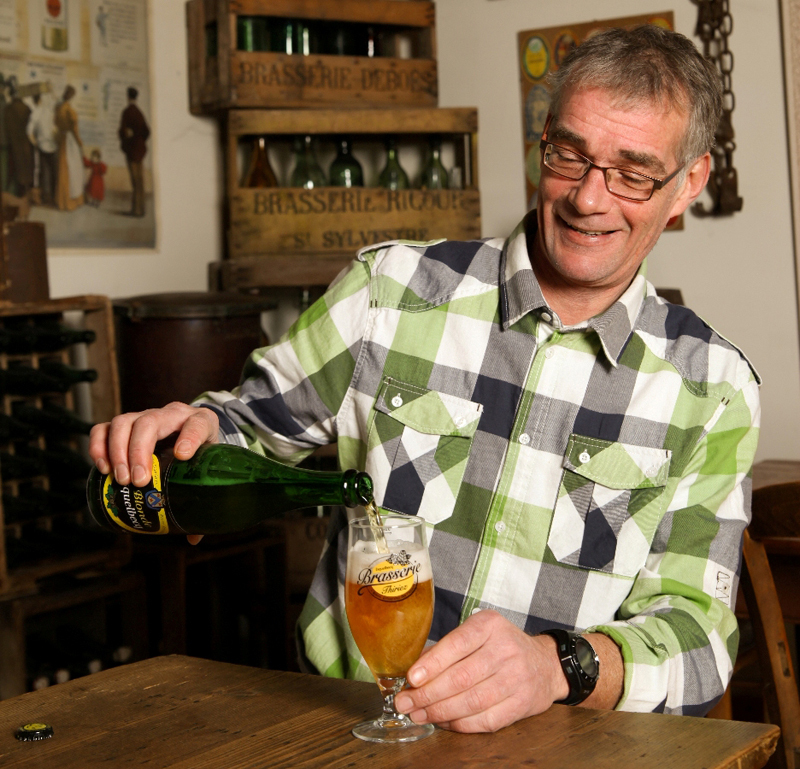 As a teenager, Thiriez discovered the bière de garde style, notably Jenlain. “This amber beer, rather strong and tasty, was a sort of revelation for us, really different from anything other beer we knew.” It planted a seed in his mind that grew over the 11 years he worked as a human resources manager at a local company. In the mid-1990s, he began to wonder whether he could make a living brewing characteristically French farmhouse ales, with a Belgian twist. He found a rustic little building that had been a brewery in Esquelbecq and began on the formulation for a beer with those qualities. Blonde d’Esquelbecq was, in his words, an “unfiltered, bottle-conditioned, and reasonably hoppy ale.” I’d add that it is earthy and etched with a tracery of lemony-to-lavender esters and just a hint of wild funk. It seems the very definition of “farmhouse” but features approachable flavors that give it broad appeal. Saisons, more than nearly any other beer style, are products of yeast. Rustic grains and light, herbal hops may inflect a saison, but it lives and dies on the flavors produced by the yeast. Thiriez’s came from the Institut Meurice in Brussels, which maintained a large collection of yeast strains. He worked with the director at the time, Alain Debourg, to find exactly the strain that would bring Thiriez’s vision to life. The one he settled on is familiar to American brewers and homebrewers—it’s known as the “French Saison” strain at Wyeast (3711). It was an early, versatile strain available to brewers that got heavy rotation in the United States. It handles hops and spices well and produces a predictable, reliable beer. White Labs and Wyeast have been steadily adding saison strains, and brewers learned that other Belgian strains, when fermented warm, produced vivid esters and phenols. But based purely on my own observation, the sensory blueprint for American saisons came from the flavors and aromas that Thiriez’s yeast creates. Daniel Thiriez acknowledges that his strain may have been the source of 3711, but says it’s different in notable ways—particularly how dry it is. Well, this will happen. Yeasts are living organisms, and populations evolve. I nevertheless find the saisons I make with 3711 to be closely reminiscent of Thiriez’s. Esquelbecq is 10 miles from the Poperinge hop fields in Belgium—and so it’s appropriate that this strain takes to hops so well. Most French examples of the bière de garde style have barely any hop character, but Thiriez’s beers are known for them. This makes 3711 a perfect bridge to the United States, where spicy, peppery flavors are comfortingly familiar. I doubt very many brewers have actually come across Thiriez’s products, but thanks to the prevalence of his yeast, they discovered them by proxy. Should one of those brewers ever find himself in the greater Esquelbecq-Wormhout metropolitan area, he might be offered a bottle of Thiriez. I imagine the experience would be like discovering an unknown relative and recognizing his face. Last December, Thiriez flew to San Francisco to brew with Cellarmaker Brewing Co., and they made a batch of Saison des Flandres together using the 3711 yeast. I’d like to think it sparked some interest in the San Franciscans who tasted it to track down a bottle of Daniel Thiriez’s beer. He deserves more attention than he gets here in the states. His brewery may not be well-known, but I think it’s been instrumental in defining what Americans think saisons should taste like. Nice article. 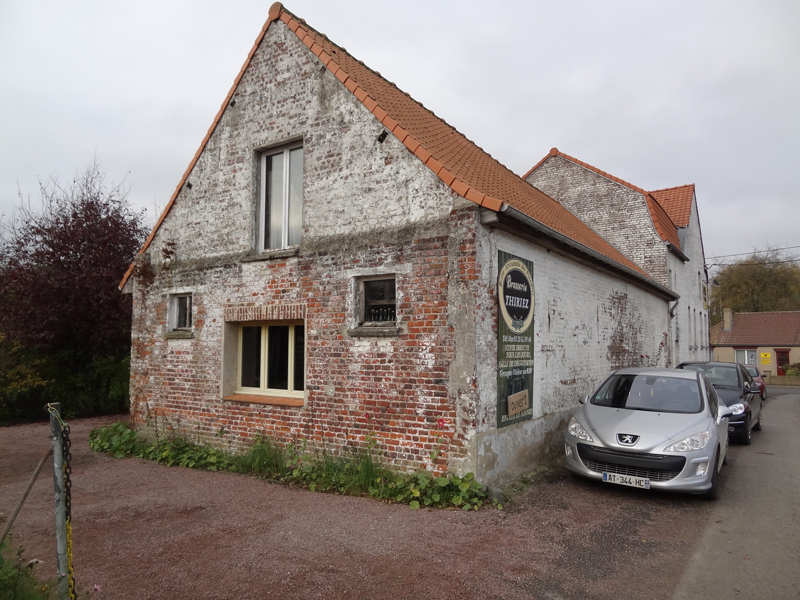 I visited the brewery and met with Daniel in Oct. 2008 on a beer tour of Belgium. Very nice, hospitable and knowledgeable man. His beers are unique and well made. Etoile du Maine is another recent collab that Thiriez did with Oxbow Brewing in Maine. Great brewer and great guy! I visited Brasserie Thiriez in October 2013 with BelgiumBeerMe! Tours and really enjoyed meeting Daniel. The afternoon spent in his onsite beer cafe will not to be forgotten. Such a nice guy who is really passionate about his work. He and his wife joined us for dinner that evening as well….a great day! Was American beer brewed ‘through a horse’? In 1973, this newspaperman tried to find out.